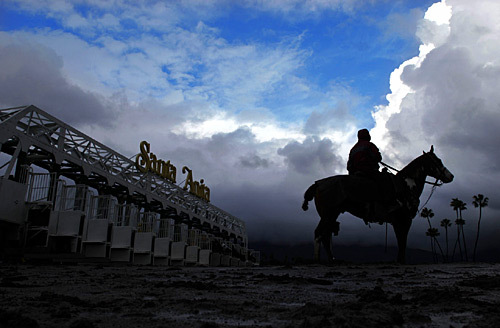 This image from Santa Anita was part of Tim's portfolio that won him the award for the best body of work at the Sports Shooter Academy. Editors note: James Rulison and 38 other SportsShooter.com members decended upon Buena Park, California this week for the 2005 Sports Shooter Academy. There were 30 SportsShooter.com members participating as students and nine SportsShooter.com members working as faculty and staff, including program director Robert Hanashiro. The Sports Shooter Academy, sponsored by Nikon, ended on Sunday with brunch and the handing out of awards. Program director Robert Hanashiro gave out a few extra awards to some amazing people. Freelance photographer Andrew Malana traveled all the way from Tokyo, Japan and was given a Sports Shooter bucket hat. University of Missouri student Chris Detrick won an award for hustle. He was everywhere. The guy worked everything and then some. He too received a Sports Shooter bucket hat. Finally, the time came for the big awards. Hanashiro and the rest of the instructors stayed up late Saturday night reviewing the photos that the Academy participants shot throughout the week. Hanashiro commented that he took a second look Sunday morning with fresh eyes to make sure they didn't miss anything. The award for best overall picture went to Eastern Washington University student Dustin Snipes for his volleyball picture. North Carolina State University student Tim Lytvinenko won the award for best body of work. Both winners received a Pro Modulus Speed System from Think Tank Photo. The Academy attracted students from as nearby as San Bernardino, California to as far away as Tokyo, Japan. I am one of the lucky ones who were fortunate enough to be selected to attend this once in a lifetime event. The academy ran for a total of five days with introductions and presentations on Wednesday night. The evening began with students meeting informally in the hallways and lobby of the hotel, the Holiday Inn Buena Park. This was our first chance to see who else was accepted to this event that had more then 125 completed entries and more then 250 application requests. A total of 30 students, all of the SportsShooter.com members, were selected with varying backgrounds and talent levels. There was a meet and greet session in the conference room with a bar and buffet that officially started the event. This image of a UC Irvine volleyball player spiking the ball over the hands of Stanford blockers was awarded the best overall picture at the Sports Shooter Academy. The night continued with two presentations. The first was from local Big West Photographer Matt Brown. This gave us all an opportunity to see what we would be shooting in the coming days. The second presentation was by Getty Images staffer Donald Miralle, who not only showed his work but talked briefly about how he took his photographs. Both presentations were inspiring and exceptional. The night ended with Hanashiro talking about the work ahead of us and how we should make the most of it. Hanashiro also sprung a surprise; the best photos from the Academy were going to be presented to the photo editors at Sports Illustrated to be considered for Leading Off in next week’s issue of the magazine. D-DAY: Thursday, February 17th. The day began with a general session and presentation from Dave Black. Dave's presentation was more of an actual lesson then just a presentation. Dave spoke about the importance of "Supply and Demand" and that you have to separate yourself from your competitors. He also talked about capturing "The Moment" and learning about your subject. He finished with reminding us to bring passion to our profession and that without it you will fail. After the general sessions we were all off in different directions and all on our own in getting there. You could have chosen to stay at the hotel and attend a speed-light portrait class with Dave Black or you could have headed out across town to UC Irvine to learn about arena lighting. Arena lighting was something I have wanted to learn about for quite sometime. You can read about arena lighting all you want but until you actually deploy it, the material doesn't always make sense. When Darrell Miho pulled up outside the Bren Event Center to teach us about arena lighting it was Jamm Aquino who quickly noted that the back of Darrell's car was sitting about 2-3 inches lower then the front. Darrel didn't just talk about how things worked he showed us and in some cases had us do the work. You didn't really feel like you were at some class but more like you were an assistant and Darrell was educating you on the way. Long Beach State water polo player Cassie Azevedo and former water polo player and Sports Shooter Academy assistant Max Morse pose under water for a Donald Mirale portrait shoot in the pool at Long Beach State. The second half of the day we were all shooting. Options included men's basketball at two different campuses, women's basketball and baseball. I think everyone was nervous for this first night of shooting; whether it was SI on the brain or just the pressure that you want to be the best. The critiques that night were not pretty. I think that first night leveled the playing field. Everyone realized that we were not all that different from one another. The night ended with the news that Los Angeles Times staffer and Academy faculty member Wally Skalij had secured nine spots for students interested in shooting horse racing at Santa Anita. This was an amazing opportunity. The forecast called for more rain and while baseball gets delayed in wet weather, horse racing doesn't. Hanashiro and the instructors quickly re-organized the morning portrait sessions for Friday and drew the names from a hat. Ralphy: Friday, February 18th. Critiques ran long on Thursday night so everyone was a bit slow out the door for morning portrait sessions. Each instructor was going to be doing a portrait session with an athlete from the supporting Big West schools. Part of the signup process on Wednesday night was choosing which session you wanted to attend. The photos from the portrait session were then going to be shown as part of the critiques that night. I attended Dave Black's session, which was really amazing. Dave had the students setting up lights and changing functions on the strobes. He also listened to us for feedback and made suggestions and offered pointers. As a student you were as involved in the shoot as he was. Other highlights included the very animated Ralphy Holmes, a men's basketball player from Cal State Fullerton who gave an amazing amount of time to the students for additional photos. One of the most amazing portrait sessions was the water polo work with Donald Miralle. Donald not only shot outside in a pool with rain, but showed students how to work with an underwater housing. We also saw a side of Max Morse we hope to never see again except in nightmares. The afternoon sessions had students behind the cameras again shooting baseball or volleyball. Hanashiro gave us a deadline of 10:45 pm. If you didn't have your work in by then it wasn't going to get critiqued until the next day. With some of us not getting back until 10 pm the pressure was on. Critiques were much more favorable. In Hanashiro's words there was a "night and day" difference. You could see the tension unwind and everyone felt much better not only about their work but themselves. 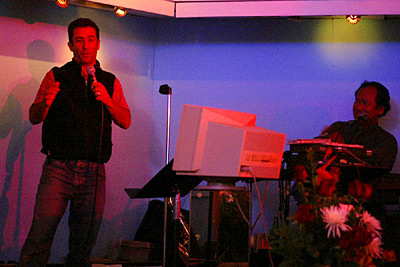 Sports Shooter Academy instructor Matt Brown sings karaoke after hours at a Thai restaurant late Friday night. After the critiques some of the students and instructors went out together for dinner. We ended up at a karaoke bar with one instructor making noises not music and another actually being cut off by the band. The result was a lot of fun and camaraderie. HUSTLE: Saturday, February 19th. Saturday was the day of the student. We were behind the cameras all day long. A majority of the students headed out to shoot a mud-packed rugby game only to be disappointed when it was cancelled. Some of us made the best of it by shooting an early basketball game while others tried to find alternative subjects. The evening sessions had most people shooting men's basketball or volleyball at UC Irvine. Each event had early call times for remote work. The UC Irvine men's basketball game had us setting up more remotes then I could count. Remotes included: 2 overhead, 3 post (2 on one side 1 on the other), 2 behind the glass (one on each end), and a couple of floor remotes. The players must have felt like they were in the NBA with 3 sets of strobes going off and more lenses pointing at them then a drunken celebrity walking down Hollywood Blvd. As I reflect back on the past week I feel that all of the photographers had some inspiring images that I know I will take back to my own work. If you get a chance in the future to apply for this type of a workshop don't just think about it DO IT! If you don't get in try again. It's worth the price of admission and then some.